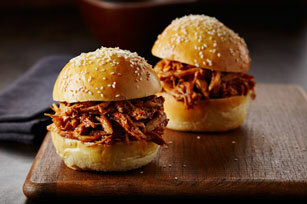 These saucy pulled chicken sandwiches are ready in 15 minutes. With only 3 ingredients, these pulled chicken sandwiches will be the fastest (and easiest) dinner you will make all week! Combine chicken and barbecue sauce in microwaveable bowl; cover with waxed paper. Microwave on HIGH 2 min. or until heated through; stir. Fill buns with chicken mixture. Use 2 forks to pull the cooked rotisserie chicken into shreds. Add a Kraft Singles Cheese Slice to each sandwich. After shredding the chicken needed to prepare this recipe, refrigerate remaining chicken up to 2 days before chopping up to add to a Caesar salad, or using to prepare your favourite pot pie or chicken soup.